Watch this: We're about to see the full measure of Trump's cowed dependence on Vladimir Putin. These are nuclear-tipped missiles and are a major threat to NATO, which Putin has long itched to dismantle. Can't you see Vlad's mind working? 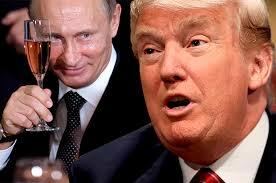 "I helped you win presidency, Comrade. Now you sit there in gold-plated White House while I make Russia great again. Maybe play with your phone." We'll be watching how Trump responds to the blatant Russian threat. Maybe he'll tweet something.